Cooling and crystallization are key palm oil fractionation process. Once crystallization successes, palm oil separation becomes easily. Therefore, different type of crystallization should have own cooling exchange surface, cooling system and mixture structure.Palm oil Cooling and crystallization condition determines the start of palm oil crystallization nuclei, the number of crystals and crystal size in palm oil fractionation process. Cooling efficiency and ordering ensure special crystal formation and filterability in palm oil fractionation.Under stirring and circulating water cooling state, according to set temperature difference between palm oil and cooling water, palm oil cooling time and control palm oil cooling process to form nuclei and slowly grow. When reaching the required temperature (depending on desired quality of soft fat obtained, typically 20 degrees Celsius), stop cooling. 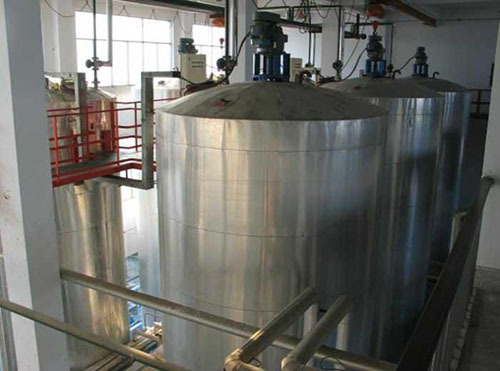 ◆Crystallization process consists of four stages: Pre-cooling, Formation of Nuclei, Crystal Growth,Final Conditioning.